Karate Alberta is a member of Karate Canada which has defined a coach development model as well as 3 pathways in order to clarify how one goes about becoming a certified coach, and to demonstrate the overall vision of the federation for its coaches and participants in the years to come. Here is the Coaching Development Model created by Karate Canada. This pathway is tailored for coaches of athletes who wish to equip themselves with fundamental karate coaching knowledge. The workshop focuses on planning, safety, basic teaching and learning theory, as well as preparing coaches to analyze karate skills. 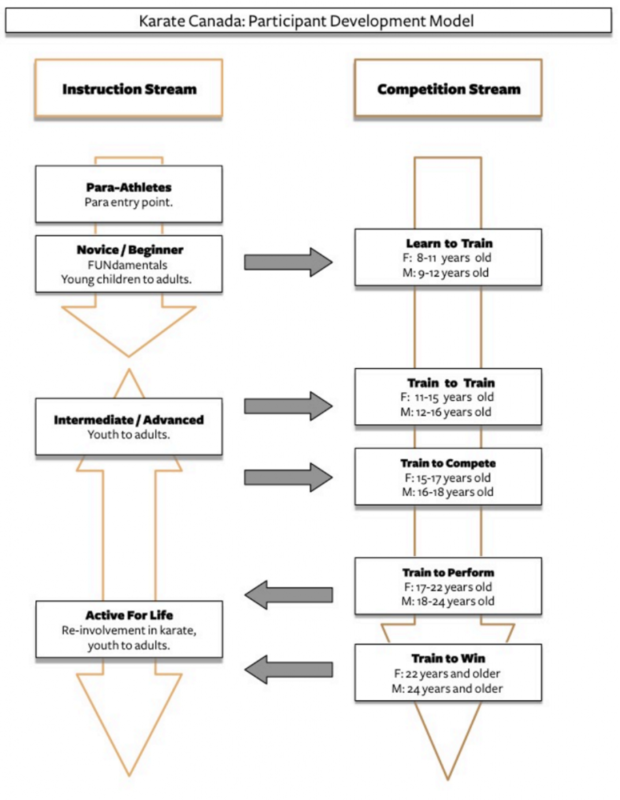 This pathway is a good introduction to the competitive environment of the sport. Coaches will learn in-depth planning, supporting and improving athlete competition skills, and a detailed overview of the rules governing karate competitive settings. This pathway focuses on senior level coaches working with Provincial and National Team athletes, this mix of multisport and karate specific modules will provide well-rounded training for developing competitive athletes. Participants will learn to manage a competitive sport program, effectively deal with sport psychology and ethical issues, as well as learn to analyze and evaluate skill and performance.